CAPE CANAVERAL — United Launch Alliance vows a “seamless” switch from the Atlas 5 to the new Vulcan rocket in launches of Boeing’s astronaut taxis. ULA is the launch provider of Boeing’s CST-100 capsule under NASA’s commercial crew program that will start ferrying astronauts to the International Space Station from U.S. soil in 2017. On Monday, ULA unveiled its lower-cost, reusable Vulcan rocket family that will begin flying in 2019. Due to budget constraints, the company will develop the rocket in steps, with the first stage coming initially. The Vulcan to fly for the first four years will be powered by a pair of Blue Origin BE-4 methane main engines and up to six strap-on solid rocket boosters. The existing Centaur upper stage will be used until a new, advanced upper stage can be fielded starting in 2023, which is Step 2 of development. “Because the front end of the rocket, the top half of it is the same as today’s Atlas, at least in Step 1 (of development), all of the interfaces for the CST-100 at the launch pad and on the rocket are identical for what they are on Atlas,” said George Sowers, ULA’s vice president of strategic architecture and advanced programs. “Any of the crew providers that are currently integrated to Atlas would have a seamless transition to this vehicle at a lower cost,” he added. The Vulcan-Centaur, like the Atlas 5, will require a 422 vehicle variant, with two strap-on solid rocket boosters and a dual-engine Centaur upper stage to put the CST-100 capsule into low-Earth orbit. But the addition of the new, high-performance Advanced Cryogenic Evolved Stage replacing Centaur will eliminate the need for solid rockets, allowing CST-100 to fly on the entry-level Vulcan-ACES vehicle. 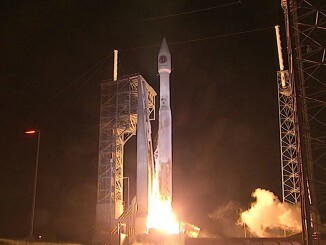 Atlas 5 is being human-rated and Vulcan will be from the start. “While our baseline launch vehicle design for the CST-100 is for the Atlas 5, from the onset we’ve designed our CST-100 to be launch vehicle agnostic, which means we can launch on any vehicle after some modifications. 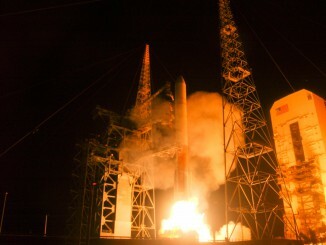 We will continue to work closely with ULA on their plans for future launch vehicles,” said Boeing spokesman Adam Morgan. ULA chief Tory Bruno says it will be up to Boeing when the transition from Atlas to Vulcan occurs. At ULA’s production factory in Decatur, Alabama, work has begun producing the first two Atlas rockets that will carry the Boeing capsules on test flights in 2017. 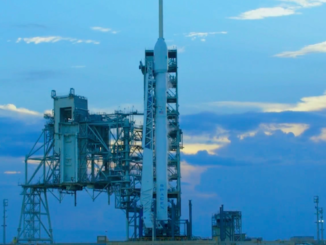 “There’s two significant changes to the rocket that we’re talking about. We’ll go to a two RL10 engine version of the Centaur and we’re doing some structural interfaces for the capsule,” Bruno said. The CST-100’s first two space missions will see an unpiloted test flight in April 2017 and a demo mission with a two-person crew in July 2017, leading to NASA astronaut taxi missions to the International Space Station beginning at the end of 2017. Those first two launches aboard Atlas 5 carry the tailnumbers AV-073 and AV-080. “The last time we were at this stage of development for a human spacecraft was in the 1970s when we were building the shuttle,” said former astronaut Chris Ferguson, now Boeing’s director of Crew and Mission Systems for the company’s commercial crew division.